3. ENGLAND - East Coast - River Crouch - Buoyage. - This is an official rfepeat of the Crouch local NtM about the deletion of the three yellow special buoys marking the previous Wallesea shiooing turning circle. 5. Dangerous Wreck on the Buxey Sand edge of the Swallowtail channel - This is an 'unofficial' notice to Mariners. *I have been told by Mr Alan Bird, a local oyster dredger and yachtsman who has seen detail of the 'Obstruction' in the channel between the Swallowtail and the Buxey Sand. *Charts currently show there is an 'Obstn' drying 2m at 51.40'951N, 001.03'541E. *However, Mr Bird records the position as 51°40’924N *001°03’660E - which is further from the edge of the Buxey Sand in approximately 1.5m CD, narrowing the channel between the two sands - and believes the 'Obstn' is substantial and dangerous remains of a wreck. *It is not marked! Mr Bird has submitted an H102 to the UKHO but kindly given me details of the wreck and a copy of the images. *I have selected the best two images of the overview. *Note that the tail end of the Swallowtail can be seen on the left of the image showing how narrow the channel is. The waypoint symbol on the chart image shows the position recorded by Mr Bird. 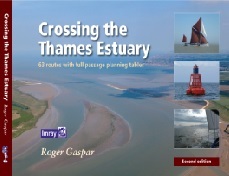 Usual page is http://www.crossingthethamesestuary.com/page9.html - select the Temporary list.